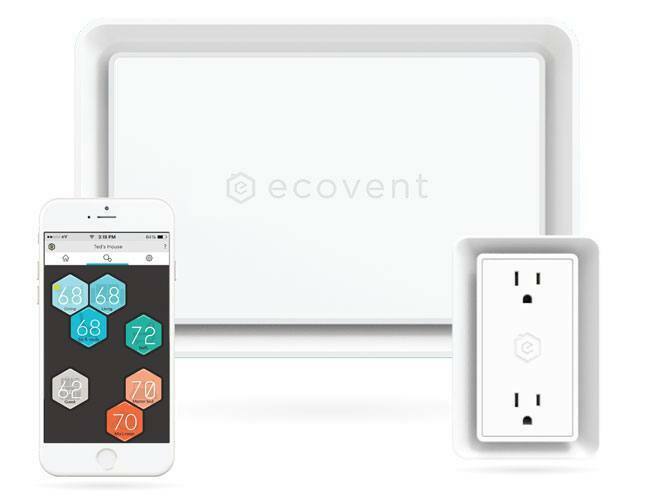 Ecovent uses a combination of smart vents and sensors to upgrade HVAC systems with precise room-by-room control of heating and cooling. The vents replace existing duct covers, and are designed to increase airflow and minimize noise while open. They work in combination with climate sensors in each room, opening and closing as necessary to maintain the appropriate temperature. Each room’s sensor takes the form of a smart outlet. It provides the same pair of three-prong outlets, and adds USB ports for charging devices at the same time. Temperature, humidity and presence (whether the room is occupied) from each room are reported to a wireless hub, which coordinates the vents throughout the house and also talks to the main thermostat. Ecovent’s app allows for different temperatures in each room — far more control than the typical HVAC system, even one with multiple zones. Family members can each set their bedrooms to the perfect temperature and commonly-used living spaces can be kept comfortable, while the home saves energy by not heating or cooling guest bedrooms and other unused spaces. Those familiar with HVAC systems may wonder about the wisdom of closing off multiple vents at once, which can increase the pressure in the ducts and lead to mechanical problems. Ecovent takes this into account by including additional sensors in the vents themselves to monitor pressure and airflow in the ducts, so the hub can make sure not to close too many at once and use other adjustments to maintain the right temperatures in each room. All of the vents and sensors connect to the hub using a low-power, low-bandwidth 915 MHz radio protocol. The hub includes WiFi and Zigbee radios to communicate with the home’s wireless Internet and with other smart home devices. The outlet sensors and hub draw direct power, while each vent runs up to three years on a handful of AA batteries. Ecovent is a graduate of Techstars and in October closed a $2.2 million seed round, which added to an initial angel investment of $605,000. The company has been beta testing Ecovent in a handful of homes and plans to release a final product in August 2015. Check out the video below to learn more.